This technology is able to recognize and extract from text phrases expressing opinions and identify both sentiment polarity (positive or negative) and the power of statements. 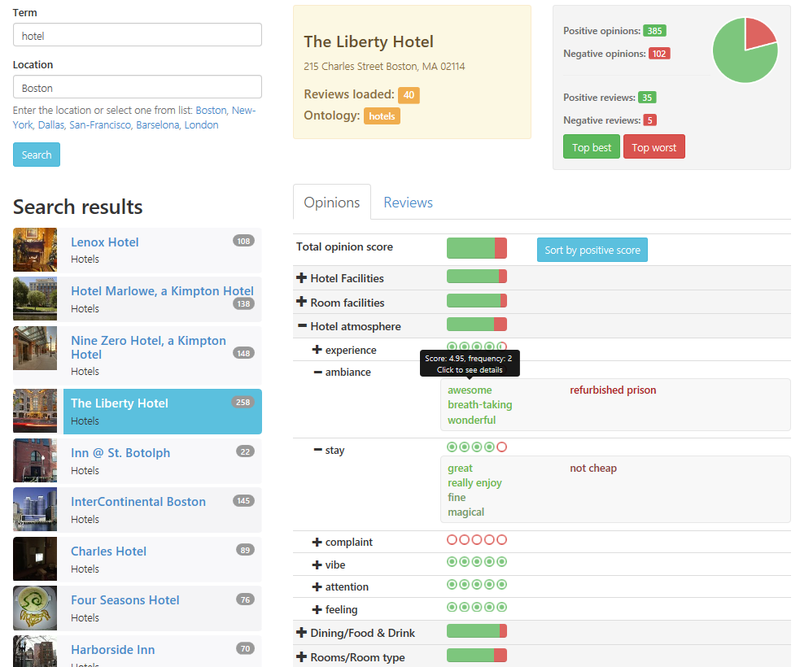 Our tool provides the researchers with precise analytical information about the mood and preferences of the target audience, e.g What do visitors think of the hotel at which they have stayed? - What do users of a certain camera say about its capabilities? - What do electors think of a candidate?. With the help of advanced semantic technology provided by Intellexer SDK our tool can extract not only sentiment phrases but also the objects the phrases refer to. Analytical report. 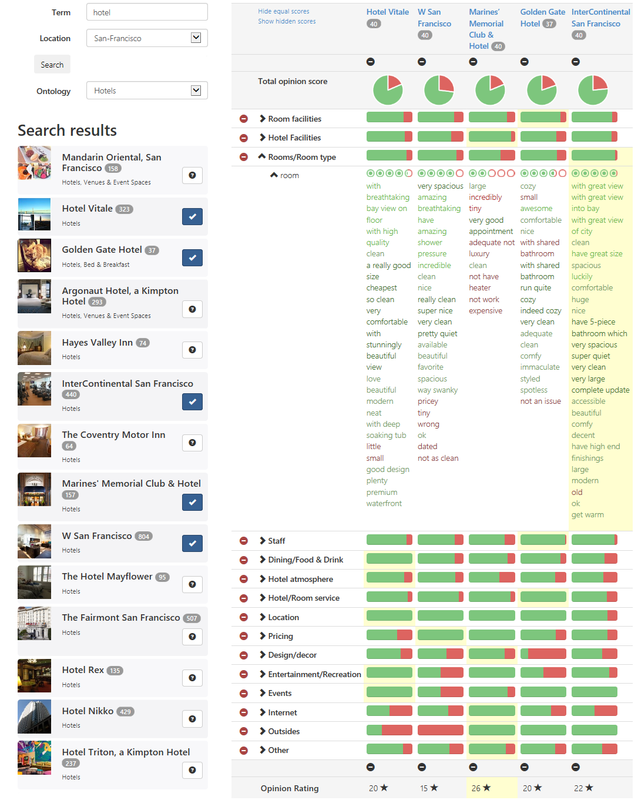 Targets of sentiment evaluation are grouped in accordance with the ontology categories. Assessments, based on the power of statements and quantity of opinions, enable identification of respondents' attitude towards the object of research. Statistical information in this report is accompanied by the structured analytical data. This helps to get a clear view of all the characteristics of the object of research. Strengths and Weaknesses analysis. An essential part of any marketing research. Our tool provides customers with exhaustive information about the negative and positive aspects of their goods or services, on the basis of user reviews and information found on the Internet. Popularity rating. Analysis of messages in Twitter and other social networks makes it possible to get an objective view of Internet users' attitude towards certain people, events or objects. Opinion Comparison. The analysis provides a user with an opportunity to compare two or more services using different parameters. These parameters are extracted if they go with opinion phrases which are defined automatically. To implement the use case we used Intellexer Sentiment Analyzer which is available as online API for easy integration or as SDK for custom software development.